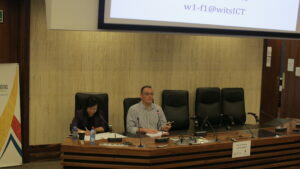 The Africa-China Reporting Project and the Chinese Embassy in South Africa held the Second South Africa-China Dialogue of 2018: 20 Years of South Africa-China Engagements: Past, Present and Future, at the Senate Room, Solomon Mahlangu Building, Wits University East Campus, on 8 November 2018. Official South Africa-China diplomatic relations commenced on 1 January 1998, thus in 2018 the two countries celebrated 20 years of relations. This anniversary offered an opportunity to reflect on engagements over the past two decades and for envisioning the future. 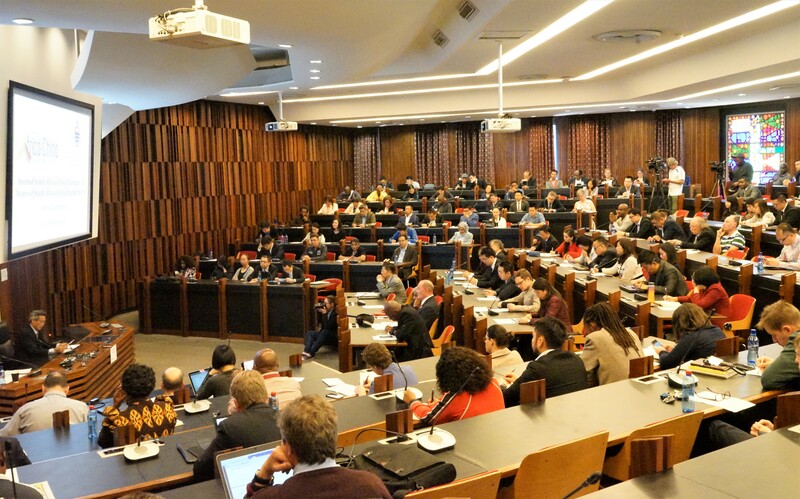 The First South Africa-China Dialogue took place at Wits University on 22 February 2018, and had a broad focus covering themes of history, diplomacy, international relations and politics, economics and trade, and culture and people-to-people exchanges. The Second Dialogue, chaired by Anna Chen, focused on geo-strategic considerations in the context of BRICS, the Forum on China Africa Corporation (FOCAC), and implementation of the African Union’s (AU) Agenda 2063. Discussions also encompassed South Africa’s engagement with China in the fields of higher education, research and science. 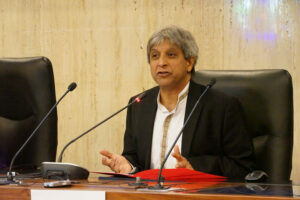 In his opening remarks, Wits University Vice-Chancellor and Principal Professor Adam Habib welcomed all attendees to the Second Dialogue and emphasized the importance of expanding relationships and partnerships among universities, particularly with China, who has become an important partner for South Africa. For too long it seems to me that South African universities have built their relationships largely with institutions in the West, and increasingly over the last few years, a number of colleagues at Wits University and myself, have recognized that there is a real urgency to broaden our partnerships. To ensure that our partnerships are as strong in the East as it is in the West. 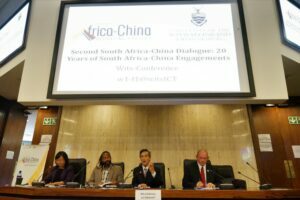 On South Africa-China engagement in the higher education and research sectors, Professor Habib stated that Wits representatives conducted a series of visits to Shanghai and Beijing in 2018, meeting all of the top nine Chinese universities and effectively exploring the possibility of partnerships. He said that this Dialogue was very important to Wits University and in particular in regard to cooperation in higher education. Professor Habib emphasized the importance of transnational issues among partnered institutions. Many of the challenges of our world are transnational, whether you look at climate change, whether you look at renewable energy, whether you look at identity, inequality, whether you look at terrorism, all of these are transnational challenges, and you cannot resolve these transnational challenges by simply having single institutions and single states. Professor Habib explained that it did not matter how good or powerful institutions were, they cannot understand the contextual specificity of all the localities of our world if they operated solely by themselves. The only way you can build and find transnational solutions to transnational challenges is if you build institutional alliances that are transnational themselves. The Vice-Chancellor explained further that in applying transnational solutions, internationalization that builds institutions was key. The local context specific to each country or group needed to be understood in order to adopt measures of development effectively and it was important for these steps to be happening in higher education in the context of South African institutions and political economy. H.E. Ambassador Lin Songtian, Chinese Ambassador in South Africa, presented the keynote address, reflecting on the past 20 years and what was envisaged in the 20 years to come. The Ambassador commemorated Nelson Mandela’s announcement made twenty years ago to engage the Republic of South Africa with the People’s Republic of China in diplomatic relations. Today we can say very proudly that President Mandela and other wise leaders of South Africa made the right decision with their strong sense of responsibility, great vision and strategic thinking. Their vision and historical contribution will be remembered forever. Ambassador Lin stated that the South Africa-China relationship had four advantages, namely political mutual trust, mutually beneficial cooperation, people-to-people friendship, and international coordination; and three major characteristics, namely strategic, all-dimensional, and mutually beneficial; and is supported by four cooperation platforms, namely FOCAC, BRICS, the Belt and Road Initiative, and South-South Cooperation. Our relations have brought visible and tangible benefits to the peoples of China and South Africa. Listing the benefits of relations to the two countries, Ambassador Lin first pointed to the political and strategic mutual trust that has strengthened over the years. He exemplified President Xi Jinping’s three recent state visits to South Africa and attendance of the BRICS Johannesburg Summit, and President Cyril Ramaphosa’s first state visit to China and co-chairing of the FOCAC Beijing Summit in 2018. “We have always approached our bilateral relations from a strategic height and long-term perspective, viewed each other as a strategic pivot and priority in our diplomacy, and have always understood and supported each other as we pursue a development path suitable to our respective national conditions”, he said. The Ambassador stated that China has become South Africa’s most reliable cooperation partner in economic and social transformation. “Today, China has for nine years been South Africa’s largest trading partner and the main source of foreign investment and tourists”, he said, adding that in 2017 China-South Africa trade reached US$39.17 billion, accounting for a quarter of China’s trade with the whole African continent. The Ambassador further spoke to people-to-people exchanges in Africa-China relations as an aspect of growing cooperation in education, culture, science and technology, health, youth, women, media, and think-tanks. Ambassador Lin added that China and South Africa have maintained close cooperation in regional and international issues to firmly uphold their common interests and those of the developing world as a whole. China and South Africa have always maintained close coordination and cooperation at the United Nations (UN), the G20, BRICS, and FOCAC to firmly uphold multilateralism and the rule-based global free trade regime. Drawing from these benefits of South Africa-China relations, the Ambassador gave four commitments, namely to the principle of equality and mutual trust, to the purpose of mutual benefit and win-win cooperation, to the people-centred approach, and to fairness and justice in common development. In my view, these four commitments are the basic and fundamental principles to ensure rapid and healthy development of South Africa-China relations. 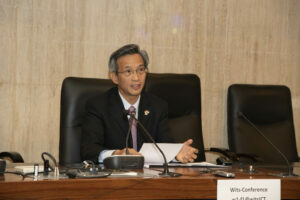 The full text to Ambassador Lin Songtian’s address can be found here. Chief Director of Regional Organisations in the Department of International Relations and Cooperation (DIRCO), Mr David Malcomson, presented the outcomes from South Africa’s co-chairing of FOCAC (2015-2018) and chairing of BRICS (2018-2019), emphasizing that BRICS had been at the forefront of promoting more inclusive and equitable participation in the global political environment, particularly for emerging and developing countries. He added that within BRICS South Africa had played a bridge-builder role, making sure that in every summit there was a document that reflected the common cause and concerns and a way forward. From the moment of its joining, South Africa has attempted to put Africa firmly in the agenda of BRICS. Chief Director Malcomson added that the objectives of placing Africa first were in line with the BRICS mechanism that aims to achieve peace, security, development and cooperation; and to contribute significantly to the sustainable development agenda, the general development of humanity and establishing a more equitable and fair global governance architecture, both politically and financially. South Africa premised its relationship with BRICS on a number of levels including the national level to use BRICS in the objectives of developing the National Development Plan (NDP), to achieve the regional integration programme of the South African Development Community (SADC), and other Regional Economic Communities (RECs), as well as the continental programme through Agenda 2063 and the New Partnership for Africa’s Development (NEPAD), the African Peer Review Mechanism (APRM), and related continental programmes such as the Comprehensive African Agricultural Development Programme, the Programme for Infrastructure Development in Africa, the North-South Corridor and so on. South Africa further maximized opportunities presented by the Fourth Industrial Revolution, and to minimize the challenges that come with it, particularly in the workplace. This attained full support from China and was the theme of the July 2018 BRICS Summit in Johannesburg: Collaboration for Inclusive Growth and Shared Prosperity in the Fourth Industrial Revolution. This became part of the outcomes document of the 10th summit as contained in the Johannesburg Declaration. Other outcomes included in the Johannesburg Declaration are the acceptance of BRICS networks of science parks, technology business incubators and small and medium size enterprises, the establishment of a BRICS vaccine research centre in South Africa, the establishment of a Women’s Forum linked to the Russian idea of the BRICS Business Alliance, the concept of a BRICS Plus engagement, support for the need to cooperate on UN peacekeeping issues, a BRICS working group on tourism, and a foreign affairs spokespersons platform to develop Africa’s own narrative on BRICS. Chief Director Malcomson added that in preparing for the Johannesburg BRICS Summit China supported South Africa to engage with the AU, African ambassadors in Beijing and Addis Ababa, and to draw up its own draft of the Beijing outcome documents. From the AU’s side there’s a push for greater involvement from the AU, and so the Chinese have been approached for more engagement and consistency with the AU Commission. The priority areas that Africa put on the table that China responded to included industrial promotion, infrastructure, connectivity, trade facilitation, and capacity-building. 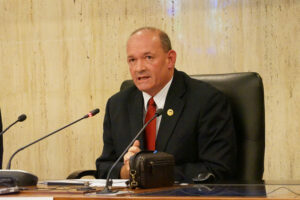 However, Chief Director Malcomson admitted that there were areas where improvements could still be achieved. He said the capacity on the African side for a proper follow-up mechanism needed to be improved. “Traditionally, the FOCAC follow-up secretariat in Beijing engaged with the African group of ambassadors in Beijing, and there’s always been a conflict between what’s going on with our African group of ambassadors in Addis Ababa and the group of ambassadors in Beijing. They often don’t speak the same language, and even ambassadors from the same country will say something different in Beijing from Addis”, he explained. Further improvements were required in the field of reporting of African narratives, he added, “How we report at each summit and each ministerial needs to have more of an African voice”. Dr Philani Mthembu, Executive Director, Institute for Global Dialogue, University of South Africa (UNISA) began by highlighting the often flawed narrative that is the assumption that African countries are passive bystanders of any international partnerships. Much of the narrative is about China as the neo-colonial power in Africa, as though African countries are simply bystanders in global politics and have no actual agency in determining their own fates. Dr Mthembu affirmed that this was incorrect and that the public needed to acknowledge Africa’s leading role now and in the past, for instance in the push for the People’s Republic of China to take the UN seat over the Republic of China/Taiwan. According to Dr Mthembu this was a demonstration of agency from the African side to actually push within the UN framework for Mainland China to be the representative of China. In addition to this, another key point he affirmed was the role of African countries in the establishment of FOCAC and the shaping of priorities in 2015 and 2018 at the FOCAC Summits. 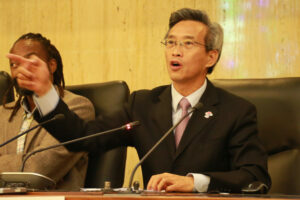 To do that, he said it was important to acknowledge the year in which FOCAC was founded. In 2000 The Economist magazine came out with a headline which said, “Africa the hopeless continent”. That was the year 2000, “the hopeless continent”. That same year FOCAC was established. What was it that China was seeing in Africa where others were seeing hopelessness? 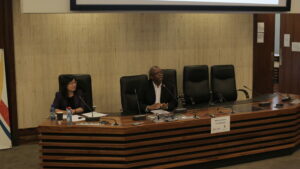 Dr Mthembu emphasized that the challenge to shape African agency was the responsibility of African countries. “What I often say is that the agenda is clear, if China says win-win, they are saying they are here to win, there’s no hidden agenda there, they are here to win”. He referenced the 2015 and 2018 FOCAC Summits where South Africa and African countries had a much larger role in shaping the agenda, aligning FOCAC with Agenda 2063 and African regional economic blocs. This indicated a convergence of issues that are becoming essential in the relationship between Africa and China, and are being shaped from the African continent. He emphasized that the task for scholars was to continue to focus on those narratives, to do empirical work, and understand whether there was a continuation to shaping partnerships in order to find the bankable projects that have a broader benefit for the rest of society. “I think that is really the key in bridging agency on a state-to-state level, but also in ensuring agency beyond the nation state”. 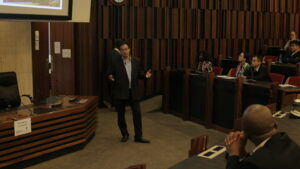 Listen to or read Dr Mthembu’s full presentation here. Professor Liu Xinying, Head of XTL/FTS Group at the Institute for the Development of Energy for African Sustainability (IDEAS) at the University of South Africa (UNISA) has been training students from South Africa and China working on a number of dedicated scientific research projects. His presentation referenced the Coal to Liquid Demonstration Project, which ran from 2005 to 2010, that trained over ten junior staff members and 40 postgraduate students at UNISA. Professor Liu stated that some of the students who benefited from the training have become business owners and independent researchers. The project was awarded the African Union Continental Scientific Award for Basic Science, Technology and Innovation in 2009, and the NSTF research innovation award in 2009/10. Other projects referenced by Professor Liu included the Biomass to Liquid Demonstration Project in 2011-2013, which was funded by the South Africa-China Joint Research Programme that was established in 1999 and has funded 104 projects in nine cycles. This project trained four junior staff members and six postgraduates. The project focused more on mobilization and networking with funding of approximately ZAR150,000, recently increased to ZAR400,000. More funding mechanisms opened between 2016 and 2018 included the Joint Flagship Project, 2016; the Joint Computational Astrophysics Centre established between CAS National Astronomical Observatory and UKZN, 2016; the BRICS Multilateral Joint Science and Technology Research Collaboration, 2016; the Joint International Laboratory of Mining Geospatial Informatics between China University of Mining and Technology and Wits University, 2016; the China NSFC, 2017; the Young Scientists Exchange programme, 2018; the New Energy Joint Research Laboratory between UNISA and HBUST, 2018; and the Joint Research Centre on the Development and Utilization of Mineral Resources, 2018. For more information on South Africa-China research and innovation collaborations see Professor Liu’s full presentation here. Senior Researcher: China-African Institute of International Affairs (SAIIA) and China-Africa co-host of the China-Africa Project (CAP), Dr Cobus van Staden stated that the Africa-China relationship and related institutions such as BRICS and FOCAC offered key opportunities as well as key challenges, and one of the challenges was to reroute the thinking about the relationship in order to reconstruct the global trade system. The emotional impact of the relationship is massive and it tends to raise debate all around the world. It forces people out of their comfort zone mentally, it makes people think about China and Africa in a different way, in ways they are not accustomed to. Dr Van Staden added that due to some of the media representations of Africa-China relations, a number of states especially those in the first world have been made to feel uncomfortable about China’s role in Africa. In response to this, he advised that when it came to discussions of Africa-China relations, nothing should be observed in silos. For example, China’s innovative streams for industrialization intended to support issues of climate change, but were also in turn used to criticize China for over-producing of solar panels and dumping. “All of these problems tend to be kept in silos and the true radical impact of the climate change issue is not being acknowledged”, he said, cautioning as to China’s impact on Africa’s energy decision making. In 2017 Egypt announced two big projects, the biggest in their field and in the world. They unveiled the biggest solar park energy installation in the world, and the largest coal power plant in the world, both of which were funded by China. China is the world’s innovator in terms of implementation of renewable energy, Africa needs all of that work to happen right now, so what we need is a radical rethink and to fine tune opportunities radically. Dr Van Staden added that South Africa needed to leapfrog into development and that China was the world’s leader in providing these technologies. All that was lacking was the thinking around the relations by the rest of the world, and how it required critical and difficult questions which were necessary for the development of Africa. He stated that Africa has more agency than what is commonly acknowledged and that China moved along with African decision making and intended direction, “so we need tough thinking and proactive African decision making as think tanks, journalists, members of government etc., to start asking tough questions moving beyond easy and artificial blankets”. Dr David Monyae, Director: African Centre for the Study of China and Co-Director of the Confucius Institute at the University of Johannesburg (UJ) stated that the geopolitics were shifting and Africa needed to be mindful of the changes in its relationships with global powers. We are all mid-wives to a changing global order, the world we live in is not the same anymore. Dr Monyae stated that the United States as a gradually declining global power did not have China to blame but itself, and “like all other empires the United States is exploding from within, as Americans are no longer agreeing among themselves”. In the case of China, David Monyae emphasized that Africans needed to be strategic with the partnerships they have established, referencing the Strategic Partnerships document of the AU that defines that in order for Africa to achieve economic development, peace and prosperity in the African continent, it needed to partner with key countries. In order for Africa to grow it needs partners, and when African heads of state transformed the OAU to the AU, they did something strategic, they brought in NEPAD for Africa to lead in its own agency, and to achieve that Africa needs to constantly work with key strategic partners. Dr Monyae emphasised the importance of China’s role in Africa as a key partner and South Africa’s biggest trading partner, and he affirmed that the continent needed to be united and deal with trade imbalances, formulate united strategies and economic objectives, follow through with the implementation of projects and plans, take advantage of new technologies occurring within the Fourth Industrial Revolution, discontinue the export of raw materials to China and supply value added products, in order to redeem Africa’s agency and best merits to influence the stability of the global market. The programme also included Q&A and discussions with the panelists that can be viewed in the videos below. 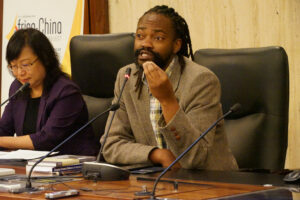 Photos by the Chinese Embassy in South Africa; videos and photos by Ndalo Ka Tenza Media. Audio by Wits Central Audio Visual Services (CAVS).